Worked on Rune Gypsy again this week. I stitched 30 more rows, so I'm at row 150 now. I'm really happy with this piece. When I first decided to do it, I was kind of worried that it would not look at all like the original art... but was I wrong or what? I must say that yesterday I was a little concerned that you wouldn't be able to tell where her nose ended. Since the colors used on the background (near her nose) and those of her face are almost the same. But after spending lots and looooooots of time staring at her, I convinced myself that you could actually see the different shades. 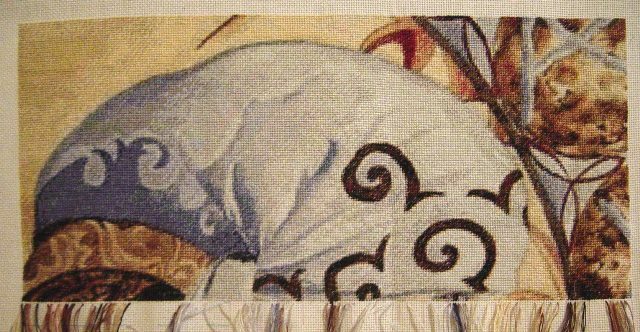 I guess I'll just have to wait until I finish with all her face, and if this issue still worries me then, I'll go ahead and do some backstitch on her face that will solve the problem. This week I continued to work on Rune Gypsy. I've completed 34% of the piece now. 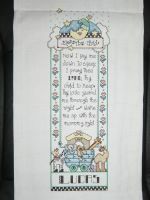 This time I decided to stitch the 20 more rows across all the design instead of working page by page. I made his decision, because I'm about to start stitching her face. And I was afraid that if I still worked page by page, a line would appear where one ends and the other starts. I now this has happened to other stitchers. I was so excited after taking the photo because I realized that I had stitched part of her eye already...and I hadn't even noticed. Sorry the picture is so bad, but it's a little after midnight here. So I had to use the flash. 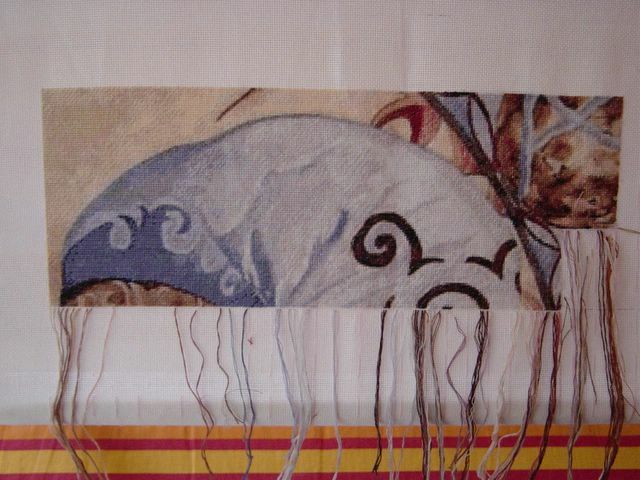 This week I worked on my HAED piece. I finished page 3 and about half of page 4. When I finish this page I would have 25% done. I had missed stitching on this piece so much, that I could hardly put it down. Last night,because I didn't have anything special planned I worked on it until midnight, which is rare for me. Since I'm an afternoon stitcher. I still haven't decided what will be my next project so I guess I'll stick to this one for a while. 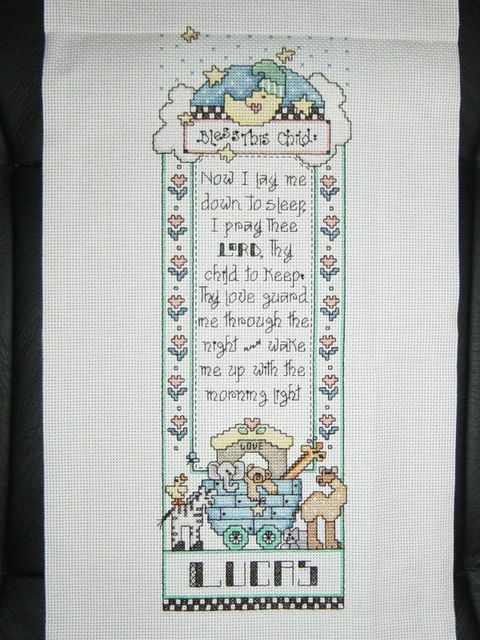 Today I finished the baby sampler I was doing for my friend. It took me a little more than a week to finish. I think it turned out really cute. The colors didn't come out to good in the photo, IRL they are very bright. I'll probably take it to the framer this week I'll show you all a pic of how it was finished in a few days. 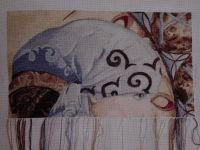 Now I'll stitch for a while my Rune Gypsy piece. I haven't touched it in almost two months, so it needs a little bit of my attention. I don't want it to become an UFO.